The deletion of files (fig. 4.3.1) will help you to avoid stuffing your hard disk with needless information. 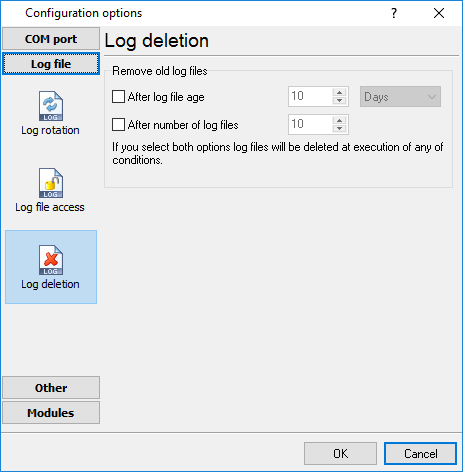 Log files can be deleted either depending on the time of storing or when the maximal number of files is exceeded. When deleting files by the time of their storage, the files that were modified last time before the specified period are deleted. When controlling the number of files, the files with the oldest modification dates are deleted first. You can select both variants of file deletion. In that case files will be deleted when either of the conditions is true.